A graphical representation of the receiving system. 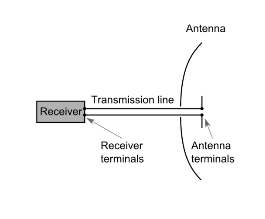 The antenna is part of the receiving system consisting, in general, of an antenna, a receiver and a transmission line which connects them. The temperature of the system is a critical factor in determining the sensitivity and signal-to-noise ratio of a receiving system. The parameters used in the equation are antenna noise temperature in Kelvin (Tan), physical antenna temperature in Kelvin (Tap), antenna efficiency (Ea), physical transmission line temperature in Kelvin (Tlp), transmission line efficiency (El) and receiver noise temperature in Kelvin (Trn), to yield a system temperature in Kelvin (Tsys).